From the moment I first heard about Death on the Prairie, I was eager to read this book. I am a lifelong Laura Ingalls Wilder fan - primarily the books, although I did enjoy the tv series as well. (I know the tv series took liberties, but I still enjoyed it, primarily because of the warm characterization of the Ingalls family.) I have to admit that I chuckled at the conversation in a book that included the line "Are you a book person, a TV person, or a truther?" One of my dreams is to visit all the Laura sites, so it was a joy to read a cozy mystery that involved Laura Ingalls Wilder history and the sites associated with her life. I really liked the character of Chloe, with her kind nature and fascination with Laura history. I also enjoyed her relationship with her sister and her boyfriend. The mystery started with a death early in the book and it deepened as the book continued, with mysterious happenings at the various Laura sites. It was very well written, and moved at a pace that seemed perfect for a cozy with rich historical details. Of course, all the Laura lore was fascinating! I loved the details about the historical sites, the quilt, and the Laura Ingalls Wilder quotes that started each chapter. I loved the conversation in the book about "WWLD?" ("What would Laura do?") That has always been something I've thought about in times like ice storms, power outages, etc. I was tickled to see a reference to others thinking the same way. This is my first book in the Chloe Ellefson series. I enjoyed it and picked up with the characters easily. I did have some confusion about the time setting. There were a lot of references to pay phones (and no cell phones in emergencies), so I am assuming the books must be set in an earlier time. I have already enthusiastically recommended this book to friends who are interested in Laura Ingalls Wilder, children's literature, and history. I am personally looking forward to reading the rest of the series as well. Win a print edition of this book. U.S. only. Ends 10/23 at midnight. I received a copy of this book from Great Escapes Virtual Book Tours and Netgalley in exchange for an honest review. New author for me but the title alone I would love to read the book. Against all odds, I have enjoyed all the previous books in this series about Chloe Ellefson, a curator at a Wisconsin museum of the immigrant cultures that settled the area from Northern Europe. 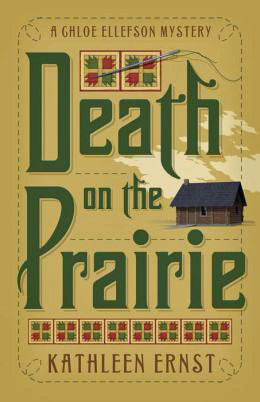 From the moment I first heard about Death on the Prairie, I have been wanting to read this book. 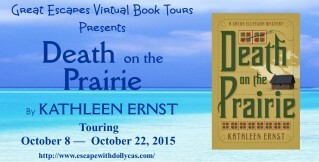 This sixth book in the Chole Ellefson mystery takes place on a tour following the different sites Laura Ingalls lived. I've been a fan of Laura Ingalls Wilder since I was old enough to read - long before the TV show. I'm also a little bit of a "truther". I'll have to put this book on my "must read" list. Looking forward to reading! Love Laura Ingalls Wilder books, so I'll probably love this book also! Visiting a historic site dedicated to Laura Ingalls Wilder would be great fun. I read all the Little House books over and over as a kid! And now, I'm a fan of Chloe's and can't wait to go on this adventure with her! Thanks for the chance to win! Thanks so much for hosting the review and giveaway! And thanks for the comments, everyone. Good luck, and happy reading! This is such an interesting series, rich in history as well as mystery. I'd love to add this latest book to the first five. This is a terrific series. Always a great story, wonderful characters and locations, and a lovely dose of history! I'll have to check this series out. Is there anything better than a book & a bath? I have read all of the Chloe Books and love them. Can't wait to read this one. I'm an old Little House fan and I love the Chloe mysteries---so this is a perfect book for me. I haven't had a the pleasure of reading the Chloe mysteries but I love Laura Ingalls Wilder and I am anxious to start! Thanks for this giveaway! I am not familiar with these books, but I look forward to reading them! I haven't been back to the Prairie since the Little House on the Prairie series ended. This will be a very fun read. All the Chloe books have been great. I am looking forward to this one. I would love to read this book. I am a great Laura Ingalls Wilder lover. this would be a new series for me. Would like to try this one. History and mystery are the best combination ever! Almost like traveling back in time and being there. I love a new series and finding a new author! I'm anxious to read this book with the Little House tie in. This sounds like the perfect read for a long Winter night. I love the Truther reference and the Little House trivia. This looks like a good one! Thanks for the giveaway! This looks like such a great book!! I would love to read this book!!! Sounds great!! My mom used to read the Little House books to me before bed each night. This would be perfect for me. This is a unique premise for a mystery series. I'd like to read it! Like the author I too love history. I will have to start looking for her books. This sounds like a great book! Would love to win!